“La cucaracha, la cucaracha/ ya no puede caminar/ porque no tiene/ porque le falta / las dos patitas de atrás”. As the name already suggest it, La Cucaracha is an online video slot with a Mexican theme and related cartoon graphics. The game is a 5-reels slot with 3 rows and 25 paylines and it was released by NextGen software developer. 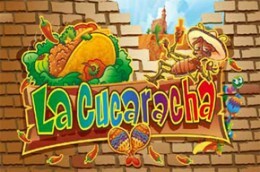 La Cucaracha offers to its players big prizes and bonus game such as a Free Games Feature, Wild Chillis, Scattered Cockroaches, and a Gamble Feature. The wild symbol is a red chilli.